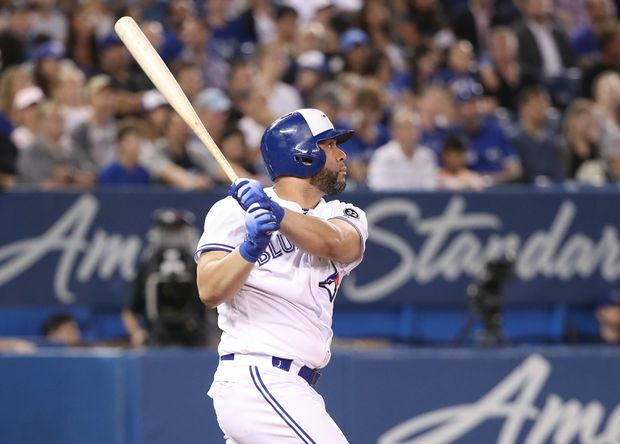 Kendrys Morales of the Toronto Blue Jays hits a solo home run in the fifth inning of a game against the Baltimore Orioles at Rogers Centre on Aug. 21, 2018. There’s something about the Baltimore Orioles that just brings out the best in Kendrys Morales, Kevin Pillar and Curtis Granderson of the Toronto Blue Jays. You might as well add Billy McKinney to that list – and maybe the rest of Toronto’s 25-man roster. And while you’re at it, you may as well include the entirety of Major League Baseball. The Orioles are that bad. The Blue Jays (57-69) once again displayed their dominance over baseball’s most futile outfit, turning on the power to inflict an 8-2 walloping of the Orioles (37-89) Tuesday night at Rogers Centre. The Blue Jays have not exactly been a beacon of success themselves this season, playing their way out of the American League playoff race weeks ago. But against Baltimore, it’s like Toronto’s game suddenly bursts into extraordinary colour – like in The Wizard of Oz after Dorothy’s house crash lands. Toronto brought out the big-boy bats in this one, ripping four home runs – including three in the fifth inning that made the score 8-2 for the home side and turned the contest into a shamble. “We swung the bats and the ball was flying tonight, no doubt,” Toronto manager John Gibbons said afterwards. For Toronto, it was their second straight win and 11th in 12 outings this season against the Orioles – with a chance at a sweep in Wednesday afternoon’s series finale. Granderson was the Toronto leadoff hitter and came into the game having hit more home runs – 27 – in his career against Baltimore than any other Blue Jay. And when he doubled and would come around to score the game’s first run, you got the sense this was just the beginning. Aledmys Diaz got the big hit parade started in the second, with a solo home run shot to left, his 16th of the year, that provided Toronto with a 2-1 lead. Toronto would pile on three more runs in the fourth, with Pillar notching his third double of the series against the Orioles while extending his hit streak to eight games. McKinney, who came over to the Blue Jays as part of the trade deadline deal that made J.A. Happ a New York Yankee, contributed a single that scored two of those runs. Toronto got really industrious in the fifth, beginning with Smoak lifting his 19th home run of the season off Dylan Bundy, the besieged Baltimore starter. Morales followed with his third home run of the series, giving him 17 on the year, one of three hits he had in the contest. McKinney then lifted his first home run shot of his major-league career to finish with three RBIs on the night. Afterward, in typical big-league fashion, McKinney’s teammates ignored him when he arrived in the dugout following his big bash. Undaunted, McKinney strode the length of the dugout, giving phantom high-fives along the way. “That was awesome, that was pretty cool,” McKinney said of his team’s humorous reception. “Everybody on the team has been great to me so far. I thought it was pretty funny. Much of the pregame chatter with Gibbons centred on rookie catcher Danny Jansen – who didn’t even play for the first time in four games. Luke Maile was behind the plate for Tuesday’s game. The play of 23-year-old Jansen has been stellar since he was promoted from Toronto’s Triple-A affiliate in Buffalo a little more than a week ago. His double in the fourth inning in Monday’s 5-3 win over Baltimore in the series opener gave him a hit in each of his first six big-league games, becoming just the third player in franchise history to accomplish that. Ryan Goins was the last, in 2013. “I really don’t think he can be any better, to be honest with you,” Gibbons said. “He’s getting his hits, he’s driving the ball. “He’s got a short, compact stroke. He’s a guy who’s going to put the ball in play. That’s very valuable. You wish more guys in this day and age would put the ball in play. Something good can usually happen." Gibbons also indicated that Aaron Sanchez is a step closer to making his first start at the big-league level since June 21 – on Saturday against Philadelphia. Counted on to be a prime contributor in the starting rotation this season, Sanchez’s year has once again been sideswiped by a hand injury – this one a bruise to his right index finger. In a Double-A rehab start on Monday night, he allowed four runs (three earned) on six hits over 4.1 innings of work. He also walked four with four strikeouts. According to Gibbons, Sanchez came out of the game feeling great and will now head to Toronto and throw a side session, probably on Thursday. Sam Gaviglio started for Toronto in Tuesday’s game, looking to shake off a six-game losing streak. He had not recorded a win since May 25 at Philadelphia.